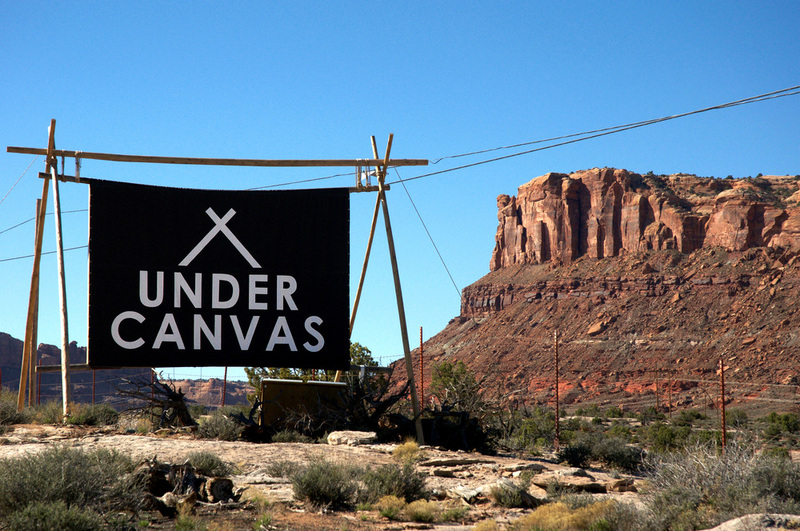 If you're looking to be outdoorsy on your next vacay but you're not a full on "camper", then you will love Moab Under Canvas! I've never been a "camper" myself, but "glamping" I can do! This place is located about 25 minutes outside of Moab and conveniently near to Arches National Park, horseback riding, mountain biking trails, river rafting, rock climbing, and hot air ballooning! This was the perfect place to unplug and celebrate the wedding of Will's brother! The highlights for me include: a REAL bed, a flushing toilet, a shower, and a wood burning stove inside the tent! You get an uninterrupted view of Arches National Park and The La Sal Mountains. And at night time, you've never seen so many stars! They offer different sized tents with different price ranges to fit what you're looking for. There are lights in the tent, but they run on batteries as there is no electricity running to any of the tents. That's right, the only way to plug in your phone is to go to the reception tent. The reception tent is open 24/7 and they have coffee, water and hot chocolate on hand at all times! Here they have a power strip so you can plug in your phone if needed and you can also order breakfast here the night before. The staff at Moab Under Canvas were so helpful and kind! They will even start your fire for you in your tent if you request it! ***Important to remember about your fire: you need to start it or request them to start it immediately! Like the moment you get there! They recommend about an hour before you're in your tent, but trust me when I tell you that is not enough time! We did the "hour before" recommendation and we froze the whole first night. However, by morning, we were nice and toasty! In order for your tent to be warm, your fire needs a chance to establish a good bed of embers and evidently it takes about 6 hours for that to happen! So, either you need to be tending your fire every 2 hours in order to keep it going, or you need to request them to stop by your tent every 2 hours to stoke your fire and add more wood. I cannot stress this part enough! If you don't do this, you will be miserably cold if you are there when the temps drop real low at night! To book your next stay at Moab Under Canvas, click HERE! You won't be sorry!